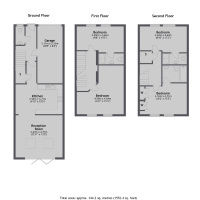 Jacksons | 4 bedroom property for sale in Chancery Mews, Tooting - £995,000 to find and add some properties. A three storey four bedroom Townhouse, full of character and boasts a driveway and garage to accommodate off-street parking for two cars. Chancery Mews is located just off of Beechcroft Road and within easy reach of Ernest Bevin College and Mayfield Nursery. Tooting Bec tube (Northern line) is 0.6 of a mile away and Wandsworth Common station is 0.8miles away. Both Tooting and Balham town centres are both within a circa of a mile offering, bars, restaurants, shops and other amenities.